Upon reading the first couple of pages of Edmonton and Okanagan based food writer Jennifer Cockrall-King’s book, Food and the City, I realize that my husband John’s family business was an early casualty of the self-service (no-service) grocery stores we know today or as Cockrall-King describes it, “The supermarket is really just the outlet mall for the industrial food system.” John’s family were grocers. In 1921 they opened, Holmes and Gordon, an independent store in downtown Kelowna on Bernard and Water Streets. By 1957, the multinationals, like Safeway, were major competitors in the Kelowna grocery market, they played hardball and built large stores on the then city limits. John’s brother, Jim, remembers staples like sugar and flour being sold at less than cost at these big, new stores. Jim remembers driving to these stores, purchasing the below cost staples, returning to the family store and putting those same staples onto their shelves so they could sell without losing money. As independent grocers they could not buy staples at the same cost as the big retailers nor could they afford to sell at a loss. Such is the story of the fall of the family grocery. This business model of driving out small retailers has been played out over and over all over North America. As Cockrall-King points out there are very few non-corporate owned food distribution networks because huge corporate grocery chains retain their own supply management centres. Author Jennifer Cockrall-King has written a very timely, interesting, well researched book that is both discouraging and uplifting. It is discouraging because it lays bare our distorted food system, the millions of people who do not have access to wholesome and culturally appropriate food, the relationship to poverty, obesity and the lack of nutritious food, and the under reporting of these issues. Although I consider myself fairly food informed, I was surprised how little I knew about the 2008 food riots in Burkina Faso when the price of wheat doubled. Riots also erupted in the Middle East, Egypt and Yemen as food staples soared with inflation. On the bright side the book highlights individuals and organizations who are working to correct this imbalance by using the urban environment to grow food, albeit an uphill battle. Cockrall-King visits several cities including Saskatoon, Kelowna, Toronto, Detroit, Chicago, London, Bristol and Paris to view urban agriculture first hand. The most heartbreaking city is Detroit. Once the juggernaut of the automobile industry and the birth place of our car-centric urban planning, Detroit is a city on the edge of the abyss; high unemployment (30%), high rates of crime and economic decline. Yet…yet…hope lies in urban agriculture and people with vision and a sense of community. Just what is urban agriculture? It is not a new idea. Backyard fruit trees and vines, small vegetable plots were once the norm. Balconies and decks filled with tomatoes and herbs. What happened? When did it become preferable to buy pre-cooked and packaged potatoes? Seemingly inexpensive imported fruit and vegetables and prepared food – is one of the things that happened. My husband, John, recalls his mother serving all the new fast food products simply because they owned a grocery store and food wholesalers would leave samples to tempt them to buy. He readily admits he grew up on convenience foods and on every camping trip the highlight wasn’t the stars in the midnight sky but a canned ham. Cockrall-King’s book serves up a food history lesson, complete with food riots, food shortages, food miles, in short, a world in food crises. However, we are also introduced to urban beekeepers, a small vineyard and winery in industrial London, vineyards in Paris, community gardens, both sanctioned and guerrilla. We meet Curtis Stone of Green City Acres in Kelowna. Stone is a bicycle powered small plot intensive grower. He successfully farms a patchwork quilt of underutilized residential land. What Cockrall-King’s book ultimately shows is that while there are no simple solutions, there are solutions. There are dedicated people everywhere who are working towards, dare I say it without sounding naive, a better world. Standing in one of the many big box grocery stores that dot our urban environment, one could be forgiven for thinking all is right with the world when tomatoes and asparagus are available at Christmas. How many miles did they travel to your plate? Our food system is based on fuel, water and a decreasing supply of agricultural land. Something has to give. This book is a call to action. So, consume this book. Purchase it from your local bookseller. 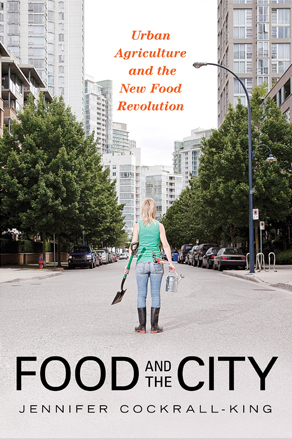 If you do nothing else after reading Food and the City but plant a few seeds and grow tomatoes on your balcony or add salad greens to your flower garden as part of an edible landscape, you will be a participant in the new food revolution. Great write-up Kim. I will definitely check this read out. Just watched the trailer for Farmageddon at http://youtu.be/IH_my56FkuQ Thanks Evelyn for posting that. It looks like a powerful must-see movie.